Talia Green studies Creative Writing and Linguistics at Emory University in Atlanta, GA. Most recently, her poems have appeared in the Alloy Literary Magazine, the Outrageous Fortune, and the Ear Literary Magazine. She is also the copy editor of the Emory-based literary magazine, MR MA’AM. 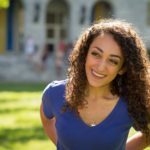 All of Talia’s written work, as well as her original music, is featured on her personal blog, InTaliasWords.com.